Students can have a variety of challenges when it comes to learning how to read. The song I'm sharing today is one of many that I use to help students learn how to read. This song identifies the five vowels: A, E, I, O and U. The song also defines vowels as letters that "stick words together. They also have two sounds-long and short. You have to listen for the difference in vowel sounds. What are your favorite songs for reading and the skills involved in learning how to read? Please share or comment below! How many of you remember the golden rule? If all of the students we work with did just that, life would be amazingly easy! Many students that I work with in the public school setting are working on impulse control. This looks different from classroom to classroom, because it includes verbal, nonverbal, physical and social and emotional behaviors. Today I'm sharing a song that helps remind students to think about their behavior. This includes anything they may say or do. I've been singing this song the past two weeks with students and they quickly learned the song lyrics. A lot of the students are also able to pair sign language to key words in the song (I sign the following key words: think, speak, do, want, them and you). What other behaviors do you shape through songs? Today I'm sharing a song that is sure to be a favorite among your younger students! Why am I so sure? Well, let's just say one word: Trains! If you read my last post, you are already aware of the awesome train track tape that I stumbled upon at the store. (I'm still excited that this product even exists!) If you missed my last post, you can scroll down or you can find it here. Well, I decided to write another song that I could use with younger students while incorporating the train track tape (the prop for this song). So, before you begin the song, ideally you would have the train track tape on the floor before the students/group enter the session area. You can even use this as part of your structure to the beginning of the session, "Everyone find a spot around the train track." Click on the link below to hear the Choo-Choo Train song. I can't wait to use this song with some of my younger groups! How about you? A song lyric sheet is available upon request for this song as well. Please email me at morewithmusic@gmail.com to request a song lyric sheet. I've been busy going through my vault of songs and making lists of new song topics to work on and spending time creating new ways to implement oldies but goodies too. Today I came across a song I shared awhile back called "Clickety Clack". Many of the students I work with love trains, so I wrote this song to implement one of their favorite toys while addressing counting goals (specifically counting and recognizing numbers 1-5). In terms of implementing this song, I typically use laminated cut outs of different color trains with the numbers on the sides of them. (Sometimes I also have the number word on the other side of each train and this allows me to address another goal with some students who can already identify the numerals but not the number words themselves). As I sing the song, students either hold up their train or place it on the floor and we put them in order after all the numbers have been identified. Well, today while I was out shopping, I saw the coolest prop for this song! 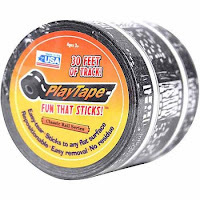 It's a roll of tape that easily sticks to flat surfaces and comes off with no sticky residue leftover to clean up. So now, I can place a piece of tape on the carpet or table and the students can place their trains on the tape. What a cool prop! It also functions as a visual number line when we place the trains in order from 1-5 also. How could you implement trains and/or train tape within your music therapy sessions? Do you have song props that you just love? Please comment below and share! It's officially the first day of summer!!! I'm posting an old song that's one of my "go to" songs for the summer season. The repetitive chorus ("It's hot, hot, hot! "), is an easy one that kids can quickly learn. It's also an easy one to sing into and record onto a BigMac, or any voice output device, for students who are nonverbal. In most sessions, I cue the kids to sing this part by themselves. I have pictures of all the items mentioned in the song and the kids love labeling each picture as we sing the song. A couple of years (and many sessions ago), I quickly learned that anytime you incorporate food within songs it's a definite win with the kids (and most adults too!) :) So, I purposely included popsicles and ice cream in this song too. What other songs do you sing in the summer? I hope you are having a great summer so far. Stay tuned for more song posts here at More with Music! Last week was spring break for us and I enjoyed a break from the busy schedule of each weekday. I was disappointed that I was sick most of last week and lost my voice (along with many other music therapy friends I correspond with), but I was so glad to not have to use up sick days at work as well. So far, this week has been a week full of songs about spring! I'm putting together a collection of songs I have written along with songs I'm working on currently for an album entitled "All things Spring". My next few blog posts will feature songs from this collection. Today I'm sharing one of my favorites. It's a song about the parts of a plant: the roots, stem, leaves and flower. This song includes short explanations of the job of each part of the plant also. Count them "1, 2, 3, 4"
The roots and the stem, the leaves and the flowers. The roots absorb water and nutrients underground. The roots help hold the plant in the ground. The stem moves water to the rest of the plant. The stem helps the plant to stand up above the ground. The leaves make food for the plant. The leaves need air, sunlight and nutrients too. The flower is the pretty part of the plant that we can see. The flower produces seeds that form new plants. When I sing this song with students, I incorporate the counting aspect of the song to motivate the students to participate. With younger students, we use our fingers to count while we sing the song. With older students, we sing each number, and I pause after each number to highlight the counting. Using a pause in the music is a great idea if you want to assess and motivate a student participating in an academic skill such as counting, labeling, spelling,etc.. I highly recommend using a visual with this song. The students learn so much when music and academic information is paired with a visual that they can see and touch. If you don't want to use a real plant as an example, you can use an artificial plant or a picture of a real plant as well. Special Olympics is quickly approaching next month and I wanted to write a song to help celebrate it. I read the motto for special olympics and instantly got to work on writing out a few verses to go with it. I know several special olympics athletes here in my town, and I know that they definitely have to have courage to show the world what they can do. Each year, Special Olympics is a great day of celebrating abilities instead of disabilities. I really enjoy seeing the athletes receive their medals as each one of them loves being told that they are a winner! I encourage everyone to go and volunteer your time at a Special Olympics day near you. You will see pure joy and appreciate every ability you have at the same time. Green day (not the band :)), is right around the corner! I'm posting this a little early so you can check out this song to sing with the students you serve before St. Patrick's Day happens this year. I wrote this song a couple of years ago, but I sing it with students each year. Singing songs about holidays is a great way to help students learn about the different holidays throughout the year. I also use visuals so the students can see the objects the song mentions (in this case: shamrocks, leprechauns, gold, rainbows,etc..). Pairing visuals with songs really helps students learn to label objects-especially new objects, new vocabulary, etc.. These are all things that we'll see today on St. Patrick's Day. Green's the only color that can guarantee no one will pinch me. What songs do you sing to celebrate St. Patrick's Day? 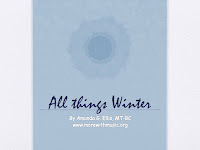 Today I'm posting my final post of implementation ideas for songs from my All things Winter album. If you want to check out all the songs on this album without scrolling through the blog posts below, you can click here. The two songs below are very similar and target the same goals and objectives. They both target students understanding appropriate clothing for the weather (in this case, Winter). Each song also identifies where each article of clothing is worn. "I Dress for the Weather" identifies the following winter garments: a hat on my head, a jacket, a scarf around my neck and gloves on my hands. I recommend having visuals or real objects to show the students as you sing this song. "I wish I was a snowman" helps students identify parts of the face (eyes, nose, mouth), and winter clothing (scarf and mittens). This song is for younger students and has a repetitive chorus with each verse. You can easily create a small or large "snowman" with white paper plates and as you sing the song, students can help dress the snowman. A great tip I recently started implementing is to use the solo plastic plates and you can attach velcro easily to them. You can print two eyes, a nose, and a mouth and the students can put them on the right places for the face. 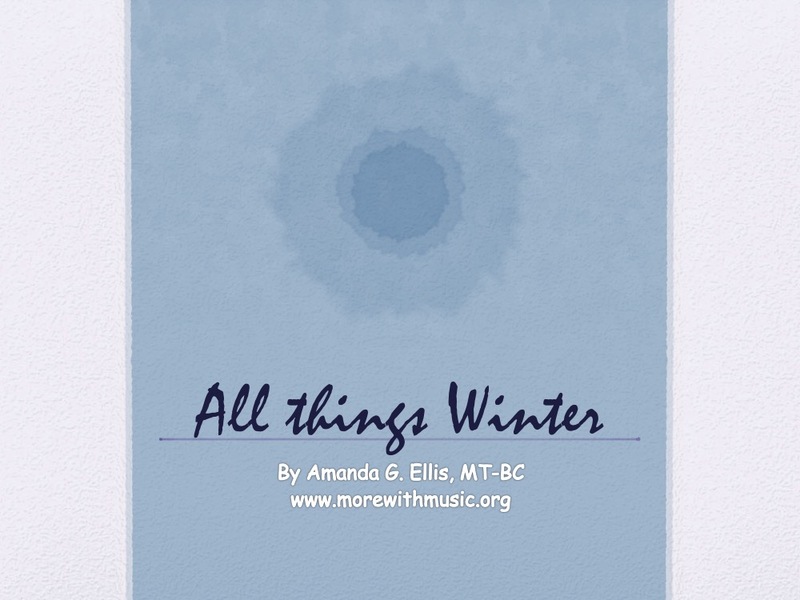 This wraps up my implementation suggestions for the songs from my album, All things Winter. I would love to hear how you use these songs and how you implemented them with students you serve. 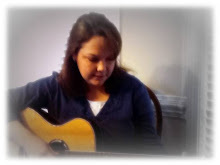 Stay tuned for new song posts! Today I'm sharing intervention ideas for two more songs from my album, "All things Winter". While some parts of our country seem to be having spring weather already, many parts of the country are experiencing more winter weather this weekend. This year has definitely had it's share of crazy weather! Today I'm sharing songs about polar bears. I love polar bears and many students do too! The first song helps students learn basic things about polar bears. The verses in this song teach that polar bears are soft and white, live where it is cold, swim underwater and love to eat. I like to use pictures of polar bears as I introduce this song. The song itself provides repetition within each verse so that students have a chance to sing along. I also incorporate sign language during the verses to help students focus on key words. The signs I incorporate are: soft, white, cold, swim, and eat. The second song about polar bears focuses on the concept of big and small and slow and fast. I like to demonstrate big, heavy feet stomping for the big polar bear and little quick steps for the smaller polar bear. I've also used a big drum for the big polar bear and rhythm sticks or castanets for the little polar bear. We sing the song and the drums go first with big, solid beats (you can say, "Big...step....big....step" to help them stay together. In a 4/4 measure, drums play on beats 1 and 3.). Then the other instrument group has a turn (for the quicker beats, I say, "Little, little, little, little". In a 4/4 measure these beats would be the 8th notes). In some classrooms, we stomp and walk around the desks to this song. Students love this and it helps them focus on others as we have to stomp on the beat and stay together. Stay warm (or dry..depending on where you live), and stop back soon for more posts! As promised in my last post (you can find it here), I'm posting implementation ideas for songs from my album "All things Winter". I have used all of the songs in this album this year and have enjoyed trying out new ways to implement then and adapt them as well. "What I wear in the Snow" is a song I wrote to compliment the book, The Jacket I Wear in the Snow by Shirley Neitzel. This book is a great book about winter clothing and is also a good one to read for sequencing objects as well. One way to implement this song is to have real examples or visuals of the articles of clothing for winter and go over (label) them first. You can also say "show me the hat" or "show me the scarf" and show the visuals (being mindful to limit the field of choices for students that need less choices when needed). You can also create a power point or Smart Notebook presentation to serve as visuals that the students will be able to see. Next, you can sing the beginning of the song, "Here are the things I wear in the snow. Show me where they go." and explain that we will be showing where each item goes on our bodies. If you have a visual made of a body and separate pictures for the articles of clothing, the students can take turns bringing each picture up and placing it where they think it goes. In many of the classrooms I work in, we first label the articles of clothing and then as I'm singing, we touch where we place each one (i.e. hat-touch head, scarf-touch neck, etc.). I want to note that I don't always sing all of the articles of clothing in this song. With certain groups I select certain articles that the students are learning to label and we start there (again-limiting the field of choices). Later we add additional items. For students that are nonverbal or need assistance via a voice output device, you can program a device called a step by step (ahead of time), to say each article of clothing or a sentence for each article (i.e. "I wear a hat on my head. ", "I wear a scarf around my neck."). I hope these ideas are helpful and lead you to create your own creative ideas! I hope all of you had a restful break and a Merry Christmas. It's a new year and I can't wait to see what 2016 has in store for all of us! I'm hitting the ground running and getting a blog post up before I head back to work tomorrow morning. So, in light of all this potential energy on a day to day basis, I decided to keep it simple and write a piggyback song. I recorded new lyrics to the tune of "Head, Shoulders, Knees & Toes". This way, we can still incorporate the actions of touching each lyric mentioned in the song as we sing it. (And you can't really do the action of touching your shirt, pants, etc.. if you don't keep them on ;). As you'll hear in the song below, I start out slower and gradually increase the speed each time. Kids love to go faster so I thought this would help keep their attention also. As always, thanks for stopping by and reading my blog posts. I hope they are helpful to you in one way or another.